Dental caries is one of the common diseases affecting humankind. The disease causes continuous destruction of intraoral hardest structure of body, i.e., tooth. Dental caries has multifactorial etiology, in which there is interaction of four principal factors i.e. the host (saliva and teeth), microflora, substrate and time. According to the WHO, the incidence of hearing impairment worldwide is 0.01-0.02% in newborns. Hearing impairment is such a condition, in which individuals are partially or fully unable to recognize some frequencies of sound that are heard by normal healthy individual. Dental caries in modern era is recognized as a completely reversible and preventable disease of dental hard tissue structures if it is diagnosed at an early noncavitated stage. The application of "Caries Assessment Spectrum and Treatment" (CAST)  was designed by incorporating positive aspects of the International Caries Detection and Assessment System,  Pulpal involvement, Ulceration caused by dislocated tooth fragments, Fistula, and Abscess,  and decayed-missing-filled index by researchers of University of Brazil and Netherlands. Dental caries may affect different people to different degrees and of different ages. Hence, dental caries may affect hearing-impaired children also without considering caste, creed, or country. A descriptive, analytic, cross-sectional study approved by the Ethical Committee of Guru Nanak Institute of Dental Science and Research was carried out. Dental caries status of 6-12-year-old children was evaluated. A total of 236 hearing-impaired children and 272 normal children were studied. The case group was consisted of hearing-impaired children of the studied area and was selected by screening through exclusion criteria. Children with mental retardation, physically challenged, cerebral palsy, and medically compromised children except hearing impairment were excluded from the present study. Exclusion criteria were strictly followed in the process of sample selection. The control group comprised normal 6-12-year-old children. Case and control studied samples were matched for the year of birth, area of residence, and socioeconomic status. Students learning in the various institutions of Malda was included in this study through random sampling method fulfilling the above criteria. Examination criteria of the present study were structured by study tool, i.e., CAST. The study was conducted after informed consent was obtained from the concerned authorities and guardians of children. All the children were examined for dental caries using sterile mouth mirror and probe under adequate illumination. All subjects were examined in the supine position. Dental caries status was evaluated with CAST, a recent caries assessment system. A well-structured and validated history sheet was prepared for proper documentation of the study. Before examination, each tooth was wiped with sterile cotton roll to get a dry surface for proper evaluation. Statistical analysis was carried out using Z-test. Among 236 hearing-impaired children, 138 (58.47%) were male and 98 (41.52%) were female. Among 272 normal children, 147 (54.04%) were male and 125 (45.95%) were female [Table 1]. Among hearing-impaired children, 69.49% were caries free. However, in normal children group, 84.19% were found caries free. Regarding caries-free individuals among hearing-impaired and normal children group, tZ-score is −3.838, P = 0.00012. The result is significant at P < 0.05. Regarding caries affected, Z-score is 3.838, P = 0.00012. The result is significant at P < 0.05 [Table 2]. Regarding sealed tooth structure found between hearing-impaired and normal children,. Z-score is −0.8638, P = 0.38978. The result is not significant at P < 0.05. Regarding restored tooth structure found between hearing-impaired and normal children group, Z-score is −2.1592, P = 0.03078. The result is significant at P < 0.05. Regarding distinct visual change in the enamel found between hearing-impaired and normal children group, Z-score is 1.5077, P = 0.13104. The result is not significant at P < 0.05. Regarding internal caries-related discoloration in dentine found between hearing-impaired and normal children group, Z-score is 0.5522, P = 0.58232. The result is not significant at P < 0.05. Regarding distinct cavitation into dentine found between hearing-impaired and normal children, Z-score is 1.6965, P = 0.08914. The result is not significant at P < 0.05. Regarding involvement of pulp chamber found between hearing-impaired and normal children, Z-score is 2.4432, P = 0.01468. The result is significant at P < 0.05. Regarding abscess/fistula found between hearing-impaired and normal children, Z-score is 3.5131, P = 0.00044. The result is significant at P < 0.05. Regarding tooth loss due to caries found between hearing-impaired and normal children, Z-score is 2.7129, P = 0.00672. The result is significant at P < 0.05 [Table 3],[Table 4] and [Table 5]. Till date, no study was found on dental caries of hearing-impaired children using a new caries assessment tool - CAST. This was probably the first study on CAST, which demonstrates caries prevalence in hearing-impaired children of Malda, West Bengal. In the present study, 69.49% and 84.19% cases of sound teeth were found in hearing-impaired and normal children, respectively, and the result is statistically significant. 30.51% of caries effected hearing-impaired children found in the present study compared to 15.81% in normal children, and the result is also statistically significant. The reasons for this observation may be that the parents of hearing-impaired children are less serious and conscious about their baby and take less care and precaution, and practices poor oral health maintenance regularly. 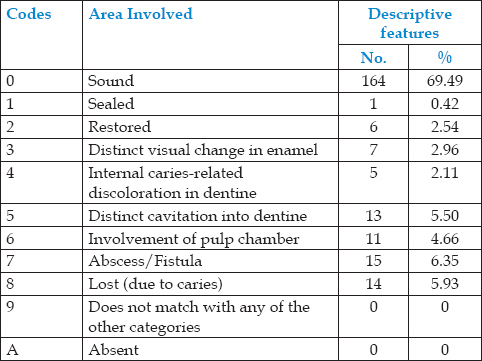 Statistically significant results also found in restored tooth structure, involvement of pulp chamber, abscess/fistula found, and tooth loss due to caries categories. It delineates more attention should be needed to improve the oral health status of hearing-impaired children. No previous study was found involving hearing-impaired children of Malda in this field of dentistry. Hence, no comparison was possible with the previous study. Poor sample size is the main limitation of this study. In this study, hearing-impaired children were expressing dissimilar kind of dental caries pattern than normal children. Hearing-impaired children were having more caries than normal group. This study invites further scope for cross-sectional and longitudinal study for the upcoming scholar and researcher. Hopefully, this kind of study will bring awareness to numerous parents of hearing-impaired children in the world. Featherstone JD. Caries prevention and reversal based on the caries balance. Pediatr Dent 2006;28:128-32. Frencken JE, de Amorim RG, Faber J, Leal SC. The Caries Assessment Spectrum and Treatment (CAST) index: Rational and development. Int Dent J 2011;61:117-23.
de Amorim RG, Figueiredo MJ, Leal SC, Mulder J, Frencken JE. Caries experience in a child population in a deprived area of Brazil, using ICDAS II. Clin Oral Investig 2012;16:513-20. Goldin-Meadow S, Mayberry RI. How do profoundly deaf children learn to read? Learn Disabil Res Pract 2001;16:221-8. Ajami BA, Shabzendedar M, Rezay YA, Asgary M. Dental treatment needs of children with disabilities. J Dent Res Dent Clin Dent Prospects 2007;1:93-8. Avasti K, Bansal K, Mittal M, Marwaha M. Oral health status among sensory impaired children in Delhi and Gurgoan. Int J Dent Clin 2011;3:21-3. Jain M, Mathur A, Kumar S, Dagli RJ, Duraiswamy P, Kulkarni S. Dentition status and treatment needs among children with impaired hearing attending a special school for the deaf and mute in Udaipur, India. J Oral Sci 2008;50:161-5. Purohit BM, Acharya S, Bhat M. Oral health status and treatment needs of children attending special schools in South India: A comparative study. Spec Care Dentist 2010;30:235-41. Reddy VK, Chaurasia K, Bhambal A, Moon N, Reddy EK. A comparison of oral hygiene status and dental caries experience among institutionalized visually impaired and hearing impaired children of age between 7 and 17 years in central India. J Indian Soc Pedod Prev Dent 2013;31:141-5. Singh A, Kumar A, Berwal V, Kaur M. Comparative study of oral hygiene status in blind and deaf children of Rajasthan. J Adv Med Dent Sci 2014;2:26-31.